Reward prediction error and fMRI: do they go together? New paper: Bissonette GB, Gentry RN, Padmala S, Pessoa L, Roesch MR. Impact of appetitive and aversive outcomes on brain responses: linking the animal and human literatures. Front Syst Neurosci. 2014 Mar 4;8:24. eCollection 2014. With Matt Roesch and folks in his lab, we have a new paper reviewing the animal and animal literatures on appetitive and aversive processing. But what I want to discuss here is one issue that became apparent when we started collecting some pilot fMRI data. Whereas work in the rat has shown prediction errors in a few places in the brain, some fMRI work has shown quite widespread signals. 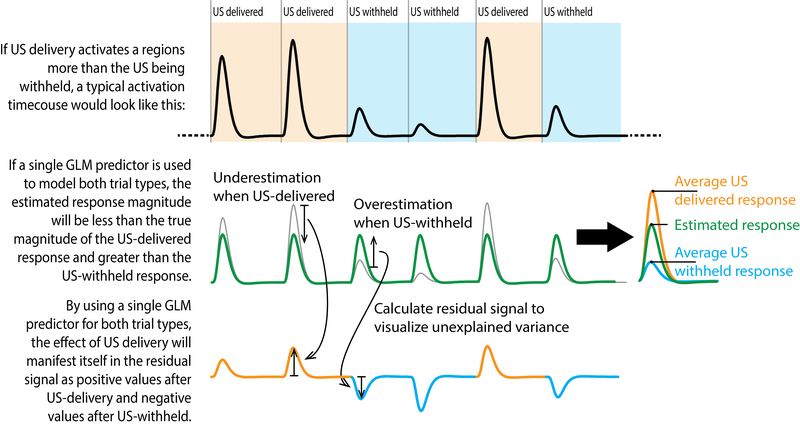 This might be true but one possible confound that we find in many papers in the literature is that regions that simply respond to the US stimulus could be incorrectly described as showing prediction errors because of the way the fMRI analysis is done. This is explained in Fig. 6 of our paper and in the figure below (thanks to Brenton McMenamin). The problem is that when a regressor modeling the US (say, reward) is also introduced in the model in addition to the prediction error regressor, it can absorb variance in a way that what is left is actually how a prediction error looks like. In that way, the region will appear to show a prediction error simply because it responds to reward itself. I have no idea how prevalent this problem is, and it is at times even unclear how the data were modeled. (In fact, as an aside, it is at times very surprising how people don’t explain what they do in their papers.) Some people have talked about this problem but again I’m not sure how much people are taking this into account.